I read a new book a little while ago called Big Magic. It was written by Elizabeth Gilbert, same author who wrote ‘Eat, Pray, Love’. That was a great book too, about new beginnings. Big Magic imparted several lessons, and honestly after each chapter I had to fight with the desire to take notes on what I’d just read, or run to write out a new journal entry or blog post, or just keep reading. One of the first things she spoke of was Fear, and the role it plays in our creativity. That one of the worst things that can happen when you put your work out into the world is the chance that it will simply be ignored. I’ve struggled with this phenomenon. I think it turned out for the better in time, because it forced me to keep asking myself why I was doing the work I was doing. This all started as fashion illustration. It started that way because I loved the style of another fashion illustrator and sought to do what she did. It took about a year, and closer to two before I really acted on anything to realize that I don’t particularly care for what the fashion world has to offer. I still haven’t written that particular post, but it wasn’t until late 2014 that I finally stumbled upon Urban Sketching. All that time perusing the internet and I hadn’t seen the thing that called to me above all else? I think that was the universe. It was the universe deciding that I was ready. 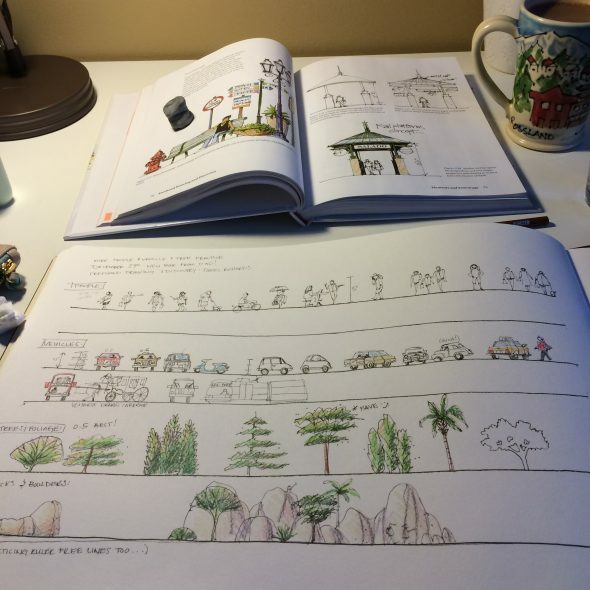 The last Christmas gifts I ever received from my beautiful mom were two books on Urban Sketching. They’re reference guides and I spent the last year treating them as my bibles, hilighting and rereading to gain comfort and move forward in areas where I am uncertain. One book states the obvious though – it could tell me everything he knew on the subject but ultimately at some point, you just have to start doing it yourself. So I started. I guess the message I am trying to put behind this post is that if painting calls to you – go and do it! It took me years of gentle nudging before I could finally put pencil to paper. I think back on my early works and some of the things I proudly showed the world (listening or not) and I want to cringe. But I keep at it. Ever hear the theory of 10 000 hours? Someone paraphrased it quite nicely on the radio recently while I was driving to capoeira. They said if you throw a bunch of hours at anything, you are bound to see improvement. For me the last year or so has been finding reference texts, instructional videos, other artists work, anything I could get my hands on to learn more about the areas I want to improve in. Try it! You might love it. This entry was posted on Saturday, January 9th, 2016 at 10:30 am. It is filed under General Musings and tagged with Musings, resolutions. You can follow any responses to this entry through the RSS 2.0 feed.